Join GLOE and Rabbi Avi Strausberg of the Hadar Institute for this 12th annual event to celebrate Passover through an LGBTQ lens. 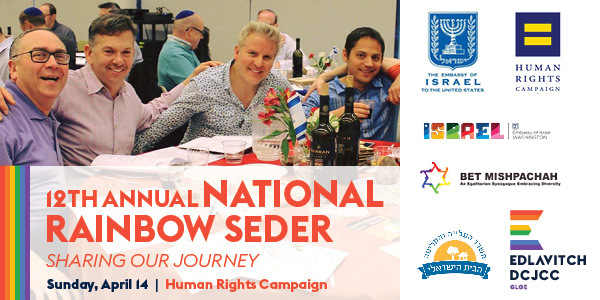 Now in its twelfth year, the National Rainbow Seder is one of the nation’s largest and longest-running Passover seders for the queer Jewish community and its allies, co-presented by GLOE – GLBTQ Outreach & Engagement at the Edlavitch DCJCC and the Human Rights Campaign’s Religion & Faith program. Hosted inside the Equality Center ballroom at the HRC headquarters in Washington, DC, this year’s program will feature a full Passover seder complete with a specially-commissioned Haggadah (the Jewish text containing the Passover story) retelling the traditional tale of Jewish triumphs of resistance alongside the hard-fought progress made by the LGBTQ equality movement over the past decade since the National Rainbow Seder’s inception. We’ll enjoy a special Passover meal as we read our own Haggadah and perform its festive rituals with the Jewish LGBTQ community and our friends. This year’s keynote speaker is Raffi Freedman-Gurspan, the Director of External Relations at the National Center for Transgender Equality. She was both a Senior Associate Director for Public Engagement, where she served as the primary liaison to the lesbian, gay, bisexual and transgender (LGBT) community, and Outreach and Recruitment Director for Presidential Personnel at the White House from 2015-2017. Raffi was the first openly transgender staffer to work at the White House. She also currently sits on the United States Holocaust Memorial Council as an appointee named by President Barack Obama. Raffi has worked in non-profit and government sectors for nearly a decade. Her career includes prior employment at NCTE as Policy Advisor for the Racial and Economic Justice Initiative; Legislative Director in the Massachusetts House of Representatives; and LGBT Liaison for the City of Somerville, Massachusetts. Raffi has also worked with the Massachusetts Transgender Political Coalition, as well as assisted in gender studies courses and research work at Boston University. A graduate of St. Olaf College in Minnesota, Raffi was adopted from Intibuca, Honduras, and grew up in Brookline, Massachusetts. She identifies as Native Central American, Latina, and Jewish. Interested in helping with event setup? Please contact GLOE Program Manager Ariel Weinstein to volunteer.